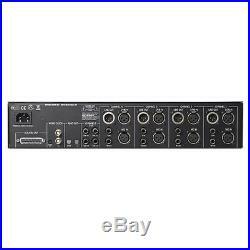 Universal Audio UA 4-710D 4 Channel Studio Mic Preamp. Item SKU# Universal Audio:4-710D-DEMO. Genuine Universal Audio factory package includes. Four Channels of Tone-Blending Twin-Finity Pre Amps and 1176-Style Compression with Built-In A/D Converters. This unit has been opened and has seen about 2-3 hours of use on the first 2 channels. Very, very little use this unit has seen in its young life. All original packaging and materials are included. The Universal Audio 4-710d is a boutique quality, four-channel microphone/line preamplifier with unique tube and solid-state tone blending capabilities - perfect for a wide range of microphone and instrument sources. This versatile multi-channel preamp offers selectable 1176-style compression circuitry on each channel, plus four additional line inputs feeding eight channels of pristine analog-to-digital conversion. Building upon UA's classic analog design approach, combined with smart modern features, the 4-710d is the most flexible preamp in the UA lineup. At the core of the 4-710d are four channels of tone-blending "Twin-Finity" mic preamps with true-bypass 1176-style compression, including specially tuned "fast" and "slow" settings. The eight analog inputs are digitized via ultra high-quality 24-bit A/D converters at selectable sample rates up to 192 kHz. Digital output is available via dual ADAT "lightpipe" or AES/EBU DB-25 connectors, facilitating integration with most popular audio interfaces. Four TEC Award-winning 710 Twin-Finity microphone/line preamps, each featuring. Dual-path 285-volt Class-A tube and transimpedance solid-state preamps. Phase-aligned tone-blending of tube and solid state circuits, creamy to crunchy. Newly designed 1176-style compression circuit per preamp channel. JFET Direct Input with 2.2M? Ultra Hi-Z impedance w/auto input override. Large backlit VU meters for flexible metering of input drive, gain level, and gain reduction. 75 Hz low cut filter. Eight channels of high quality 24-bit A/D conversion. Selectable sample rates up to 192 kHz. Digital output via dual ADAT optical and AES/EBU DB-25 connectors. 8-channel soft limiter (switchable for all channels). LED metering array with clip/hold indicators. Digital outputs anti-pop protection on power-up. Universal voltage internal power supply. Heavy-duty metal construction, two-space rack unit. We are here to help answer any question you may have. We can easily be reached using one of the options below. DealZone Music 3200 Fujita St Torrance, CA 90505 USA. 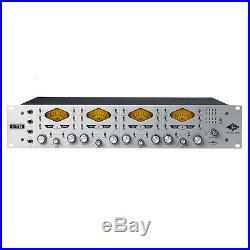 The item "Universal Audio UA 4-710D 4 Channel Studio Mic Preamp" is in sale since Sunday, January 01, 2017. This item is in the category "Musical Instruments & Gear\Pro Audio Equipment\Preamps & Channel Strips". The seller is "dealzonemusic" and is located in Torrance, California. This item can be shipped worldwide.